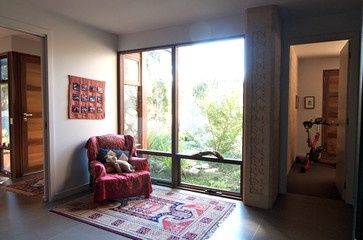 Designing with Rugs / A handmade area rug (reproduction Caucasian Shirvan design) lays claim to an otherwise undefined space and establishes an intimate sitting area. It's easy to see and appreciate from this picture how rugs literally have the power to make a room. 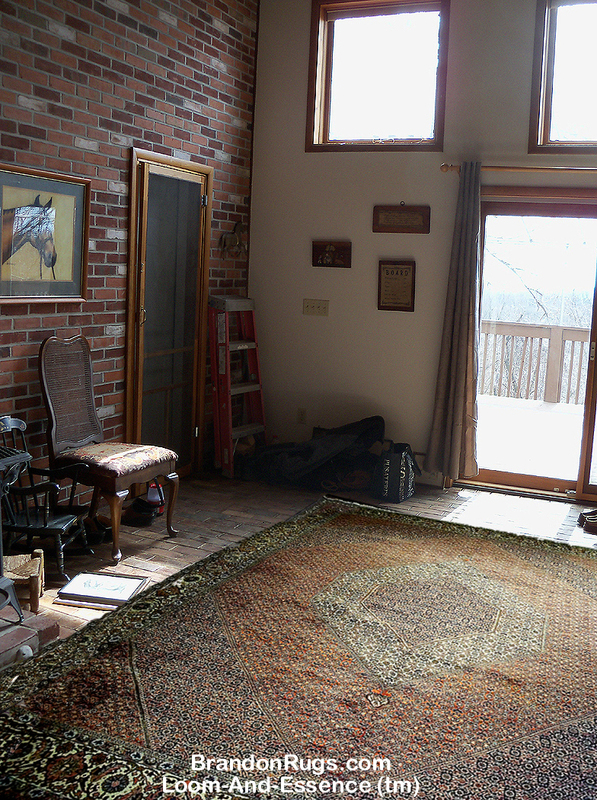 And it doesn't always take a big rug -- this one is only 5' X 4' -- to do the job. The handmade area rug (a reproduction Caucasian Shirvan design) lays claim to an otherwise undefined space and establishes an intimate sitting area. "In the mouth of two or three witnesses shall every word be established." The truth of the shared conclusions is thus settled. And remember that fine quality handmade rugs are a great way to improve your home; an improvement that requires very little effort if you use Brandon Oriental Rugs to help you with your project. 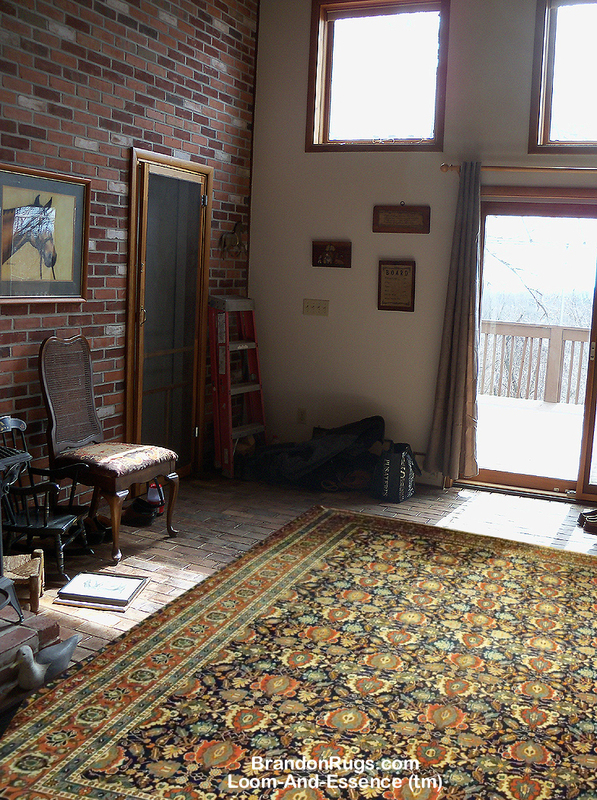 Here's an example of the difference that rugs can make in a room. Our client has a large room with brick walls and floors and has been looking for a rug to bring more luxury to the area. With some rudimentary applications of PhotoShop to a picture of her room she provided to us, we were able to provide a virtual demonstration of the improvement that a fine rug will make in her room. 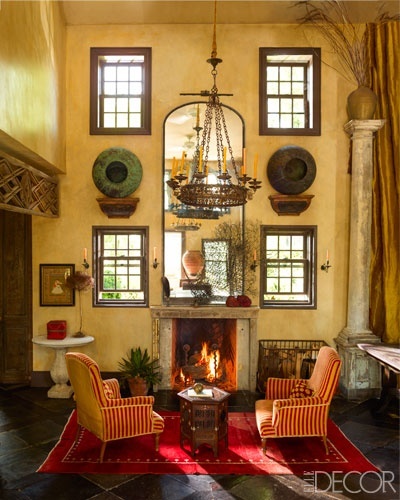 Designing with Rugs / Modern Carpet (Hand-knotted in Pakistan) anchors a visually stunning sitting room. The understated simplicity of the rug (adapted from traditional Gabeh style) brings just a little more drama to an already impressive room. The designer/owner chose a berry red background with golden accents. The rug style is also available in a "reverse colorway" (gold with red) and numerous other patterns. Size 8x10 -- as shown -- costs about $2,600. A brief look at some lovely, new, non-traditional hand-knotted rug designs. It has taken some time for qualities to arrive with "new looks" we're excited about; and can offer our customers with the same assurances as traditional rugs. All of these pieces (and others we are anxiously awaiting) are hand-knotted, using premium grade materials, and show artistic control that places them in a category far above most of the contemporary rugs presently flooding the market. They can proudly grace the floors of your home or office with a timeless elegance that will not grow old for the many years that they will endure .